The XTENDEX® PS/2 KVM extender provides local and remote KVM (PS/2 keyboard, PS/2 mouse and VGA monitor) access to a PC up to 600 feet (183 meters) using CAT5/5e/6 UTP cable. It is available with optional stereo audio or RS232. Supports resolutions to 1920x1440. Also known as: KVM extender, cat5 kvm extension, keyboard monitor mouse booster extend, remote kvm cat 5, kvm range extender. 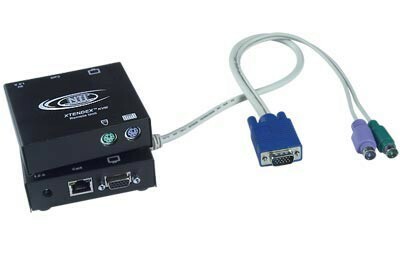 The XTENDEX® VGA PS/2 KVM Extender provides local and remote KVM (PS/2 keyboard, PS/2 mouse and VGA monitor) access to a PC or NTI KVM switch up to 600 feet using CAT5/5e/6/6a cable. Supports two users: one local and one remote. Local unit provides local KVM access. Allows local and remote access to network servers. Optional external surge protection available. Keep-alive keboard/mouse emulation for flawless operation. Use in-house CAT5 wiring to locate a keyboard, monitor and mouse remotely. 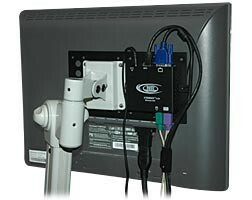 Optional VESA mounting bracket is available for mounting the remote unit to the back of a flat panel monitor. Supports a PC, SUN Fire™ V20z, or NTI Switch. One male 15-pin HD / two male 6-pin miniDIN connectors for PC or NTI KVM switch. Optional RS232 support - female 9-pin D connector. Optional stereo audio support – 3.5 mm stereo plug. One female 15-pin HD / two female 6-pin miniDIN connectors. Compatible with Japanese keyboard layout. Supports PS/2 mice including the IBM ScrollPoint mouse. Optional RS232 support - male 9-pin D connector. Optional stereo audio support - 3.5 mm stereo jack. Supports resolutions up to 1920x1440; refer to the resolution chart below for resolutions at different lengths. One female 15-pin HD connector / two 6-pin miniDIN connectors. Optional 3.5 mm stereo audio connection. 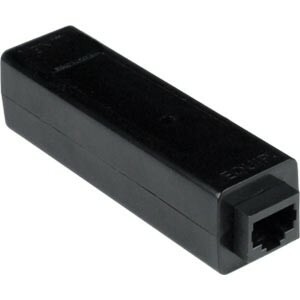 Optional male 9-pin D connector for RS232. Automatically adjusts the video quality to compensate for varying lengths of CAT5 cable. Use the PWR-48V-9V0-6A or PWR-12V-9V0-6A DC-DC power converter to install the local unit in a Telecom environment. The XTENDEX-SP CATx Surge Protector protects equipment running on CATx unshielded twisted pair (UTP) cable against the effects of electrostatic discharge, faulty wiring and lightning. Use a protector on each end of the line to provide increased protection on each end against surges. Protects equipment running on CATx unshielded twisted pair (UTP) cable against the effects of electrostatic discharge, faulty wiring and lightning. The use of two protectors on each end of the line will provide increased protection for each end against surges. Use to mount the remote unit to the back of a flat panel monitor. Compliant to VESA 75 and 100 mm (3 and 3.9 in) mounting hole patterns. Compatible with the remote unit only. "We have been using the NTI KVM extenders for 5 years. The quality of the video has been superior to other brands that we have tried in the past. Along with the reliability of this product, the customer service team is very friendly and helpful. I would highly recommend NTI products for KVM extension." "Thanks so much for a great unit! The ST-C5KVM-600 KVM extenders are a perfect solution to allow two workstations to access the same computer. Excellent video quality at 400 feet, we will be purchasing more as needed." "The ST-C5KVMRS-600 unit works great with our touch screen displays. We got it right the first time. Thank you for your assistance." "The thing that most impresses me about NTIs XTENDEX™ ST-C5KVM-600 unit is the video resolution capabilities. Units by other manufacturers in the same price range will only accommodate a 1024x768 resolution. This unit has far greater capabilities for the same price." 1. Your products offer us much more flexibility with the options that are available. 2. The quality is equal to, if not higher, than the competitive products we have used in the past. 3. For our projects, which are Mega and Super Yachts on the oceans of this world, you provide us with many of our IT needs, integrated into our complex systems. I should also mention my technical questions were handled with courtesy and efficiency, which makes us feel comfortable with NTI." "Brand 'A' units are a thing of the past. They fail on the MILDEST of power faults, completely collapse in high RF fields, often require multiple re-boots to work at all, and come with a bulky cable set making a rack mount location an absolute nightmare. NTI's ST-C5KVMRS-600, in METAL boxes, tolerate the power company in a size that nicely velcros to the back of a rack computer with short cables. NTI's work beautifully with Cat5 in high RF fields without special shielding. Well done. Don't change a thing, PLEASE!"